In the long ages before systematic reference the names of gemstones, like the names of flowers and other natural objects, tended to get shifted around from one type of object to another. This was a kind of advertising, in part. A name once established developed a patina of inherited glamour, so tradespersons blithely re-applied the names, either ignorant themselves or certain of never being caught out by anyone else. The stone topazos desribed by Pliny the Elder in the Natural History, XXXVII.32.8, is clearly not the gemstone now known as topaz; inasmuch as it's anything specific, it seems to be some sort of chrysolite; he describes it as a leek-green stone from which you can carve statues. He derives the name from a supposed island in the Red Sea where the stone was found. The island's name, in turn, is said to come from the words "to seek" in the language of Troglodytic sailors, who sought the island among its many fogs - Pliny seems to be thinking of Greek "to pazô", which means "to conjecture". Whatever reality this island may possess, the derivation is typical of the absurd etymologies of classical and post-classical scholars; nothing was known of the historical development of language, so names were explained from their resemblance, nearly always misleading, to words in contemporary language; as if you were to suppose that Chester had something to do with a chest, or Belfast with a fast bell. But those who prefer to surmise a derivation from the Sanskrit tapas (heat, flame) may be falling into another common trap, the romantic assumption that a potent and magical modern word is likely to have a fittingly potent and magical origin. The modern topaz is a granitic gemstone that may be colourless, yellow, blue, or sometimes other colours (there is also the term "oriental topaz", which is a yellow sapphire). In western literature the word eventually came to be associated with a smoky sort of yellow, useful for describing feline or otherwise enigmatic eyes: the type of eyes that are beautiful but in which you can't read what the person behind them is thinking. The stone collection of my childhood contained a topaz, a small dull pebble so far as I recall. Perhaps it was this, along with the connotations of haze, glaze, and other words with "az" in them, that suggested a cloudy, translucent texture - more distantly evoking some rich confection, marzipan crossed with toffee perhaps. Other parts of the word must also have contributed their suggestions - opaque, opal, topiary, Topic, topi... 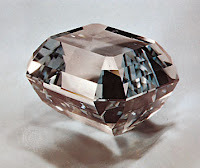 Anyway, I've always envisaged something lozenge-shaped or gibbous, not big crystals becoming big brilliant-cut jewels. The B-52s managed to deploy the smoky yellow connotation (for sunlight winking off a skyscraper) and yet combine it with azure which (my scientific poll informs me) is something else that the word topaz tends to suggest, along with Aztec. As in "Trism", "Strobe Light", "Planet Claire" etc, "Topaz" is concerned with those shining scenes in space in which there is neither night nor day because we are outside the ambit of the earth (like the Blue Danube episode in Kubrick's 2001). I dream that, the world being so vast, there are isolated tribes (not yet represented on the Web) who take the B-52s seriously as visionaries, and I'll one day meet up with them - likewise, those who continue to crack their knuckles over The Dancing Did, or those whose idea of American high-life is largely based on the recordings of Julie London... extrapolations from the more peculiar tastes of my youth, the ones I didn't often get the chance to go on about. The last time I met an old mate of mine - someone who normally listens to Monteverdi and that kind of thing - he had found some reissued CDs in a garage by a band he'd favoured when at school. (Though I'm the same age as him, I didn't like the same bands.) I listened, horrified by the dreary, grotesque ugliness of the music. More recently, however, I too ran across and purchased a CD by a band of my own schooldays, music I hadn't heard for a very long time. I thought it was unbelievably good, always undervalued, nothing to touch it since, etc; I wanted to play this CD LOUD for everyone around me, I wanted to give them copies for Christmas. Suddenly I grasped that what I heard was just the same as what my friend heard. That what absorbed us was really nothing other than the re-opening of some imaginative highway in some deep chamber in our own heads. It had hardly anything to do with the hard-working musicians from northern cities that (severally) engaged us. Here is what this post is really about. (...lorries to the canneries, carrying plums...). 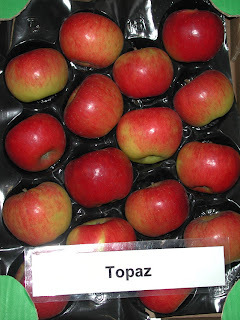 "Topaz" is a modern variety of apple developed in the Czech Republic (info from this excellent site: Orange Pippin) and it is currently my absolute favourite for purposes of chopping up and adding to muesli, where the sharp, energetic flavour makes a perfect complement to sultanas, oats, sunflower seeds and water. The main point about "Topaz" is that it was developed to be resistant to apple-scab; could therefore be farmed organically yet still be sold to supermarkets; this is now such a significant part of the market in Europe that it's the prime motivator for many of the new breeding programmes (as per Ariane (France 2002), Rajka (Czech Republic, 1990s)...). A good change, I think, from the era when today's classic apple-shape developed, its deep flute around the stem acting principally as a reservoir to stop the pesticides from running off too quickly. Fashions in the look of apples change. Uniform deep red or golden-green inevitably suggests the dull flavours of the supermarket apples of our youth; the modern supermarket apple is invariably a mixture of colours, like the streaked Braeburn. 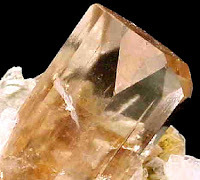 Topaz is broadly flushed with red on a ground of green or yellow. When the apple is purely red and yellow, it looks remarkably like a nectarine, but sometimes this signifies over-ripeness; the juicy zinginess is essential, and the apples should be kept in the fridge. Topaz's most interesting feature is the very indented base, which means the core is noticeably short (like a miniature Bramley). The knobbly, cheerful effect you will very soon learn to regard as the pinnacle of apple-beauty - but really that's because you're thinking about how much you would like to eat it. When you slice the apples, the exposed surfaces glisten - but not all the surfaces, only about half of them; a curious feature (I suppose true of other glistening apples too) that I've yet to fully comprehend. So, that's it for Topaz, but how do the competition fare? Let's check out the rules first. This is a muesli composed of oats, water, some sort of dried fruit for sweetness - sultanas are amazingly cheap right now - and some seeds for texture: sunflower seeds and pumpkin seeds are good, and so are sesame seeds though they do float around on the surface in a disconcerting fashion. No milk or wheat products, and all ingredients organic, natch. We're looking to add half a fresh apple - we want juiciness, crispness, and a bit of bite to offset the sweetness of the dried fruit. In England I'm only interested in organic apples, but in Spain this rule has to be relaxed, because even though much of our organic supermarket fruit and veg is grown in Spain, it is generally unobtainable there, or has a street value of ten thousand euros a kilo. Spartan. A small apple, and most of it is the core, so you might need to use a whole one for your breakfast. But it has a reasonable flavour, better than most of the supermarket standards. Braeburn. This is about the best of the standard varieties. It is of course extremely reliable. Attractively streaked, crisp in texture, and with a reasonable if not jump-up-and-shout-about-it flavour, it's the one to choose when there's nothing more exciting around. Red Chief (Spanish). I should have guessed from its suspicious resemblance to Red Delicious (dark red and with a long narrow base). This is the worst apple I've ever eaten, thick bitter skin and tasteless fluffy interior, inedible in all circumstances short of starvation. Pera (Spanish). A very peculiar apple. It is green blotched with brown, and is the shape of a pear (which is what "Pera" means), except that the stalk is at the wrong end. It has a nasty bitter taste and certainly no place in my muesli. Cox's Orange Pippin. The most admired of apples, but you can't often get organic Cox's, because they are so prone to apple scab and numerous other blemishes. When you find them buy them, they're brilliant in muesli, though Topaz still has more bite and is maybe even better adapted to this particular scenario. Egremont Russet. Always hailed as the token survivor of supermarket homogenization, it's in every way a distinctive apple - frosted golden brown, and with a peculiar flavour that probably goes very well with Lancashire cheese. But in muesli the Russet's dry flesh is a major downer, and I find the flavour at best disconcerting.